South African based telecoms company MTN Group marked Mandela Day by conducting various acts of goodwill in some of it’s operations across Africa and the Middle East. The 18th of July has been officially adopted by the United Nations as “Nelson Mandela International Day”. 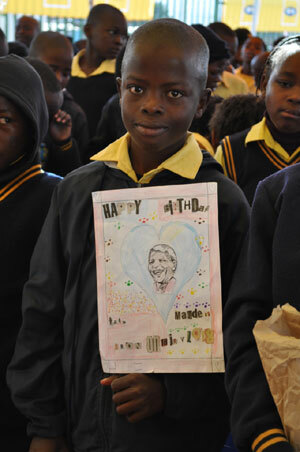 Mandela Day marks the birthday of South Africa’s first democratic president and rather than being a public holiday individuals, communities and organisations are encouraged to mark the day by giving 67 minutes of their day in support of a chosen charity in service of the community. The 67 minutes is in honour of the 67 years Madiba spent fighting for the rights of humanity. MTN Group press officer Zinhle Dhlamini indicated that not all the groups country operations would carry out activities. Other than South Africa the company’s press release cites activities in Guinea Bissau, Sudan and Zambia. Among various activities in South Africa MTN staff visited students at Zandspruit Primary School in Zandspruit an informal settlement north-west of Johannesburg. MTN staff distributed gifts to the students, including bicycles and school shoes (See pictures; more available on our Facebook page). MTN staff also assembled a jungle gym and handed over a microwave, sink and gas stove, for the school kitchen. MTN employees will use Mandela Day to celebrate the achievements they made during 21 Days of Y’ello Care, an annual MTN staff volunteer programme that takes places from the 1st to 21st of June. This year’s programme focused on education, and saw thousands of employees across MTN’s vast geographic footprint in Africa and the Middle East undertake activities to improve the quality of education and schooling infrastructure. They re-furbished classrooms and libraries, provided computer centres, technical training, bursaries, career guidance, books and school lessons on a variety of subjects. In an inspirational message to more than 24 252 employees on the eve of Mandela Day, MTN Group President and CEO, Sifiso Dabengwa, paid tribute to MTN volunteers for acting out their selfless deeds in keeping with Mandela’s legacy of doing good for humanity. “For us at MTN, everyday is a Mandela Day. As a corporate organisation and as a people, we live by Mandela’s example through what our employees do for their communities, as well as through the work of MTN Foundations, which help us to effectively balance our commercial imperatives and the social needs of the communities in which we do business. “Thanks to your efforts, tomorrow we will observe Mandela Day by celebrating the achievements we made during the 2012 edition of 21 Days of Y’ello Care – now in its 6th year and still growing in terms of its beneficiary reach and staff participation,” said Dabengwa. “In true Mandela style,” Dabengwa said, “you sacrificed your time and invested your energies in commendable efforts of ‘service to one’s fellow human’ in an all-out endeavour to improve access to, and the quality of, education for our communities. In an era where governments are experiencing financial constraints in addressing a myriad of education challenges, you did not fold your arms while school infrastructure deteriorated and learners travelled long distances to school – some without books. Instead, you competently rose to the challenge by re-furbishing classrooms and libraries, providing computer centres, technical training, bursaries, career guidance, books and school lessons on a variety of subjects. Indeed, you have given our children a rare opportunity to one day become economically active global citizens,” he said. To continue where they left off in June, MTN Zambia has identified a Mandela Day activity at the University Teaching Hospital, Zambia’s largest hospital, to prepare meals for out-of-town patients visiting the hospital. MTNers in Sudan will partner with the South African embassy in Khartoum to rehabilitate one of the ancient schools in the city, alongside other embassies in the country. In South Africa, employees will prepare lunch meals for learners at Qoqizizwe Primary School in Orange Farm, Johannesburg. They will also donate two water tanks with a capacity of 500 litres each, to address water shortage at the school. 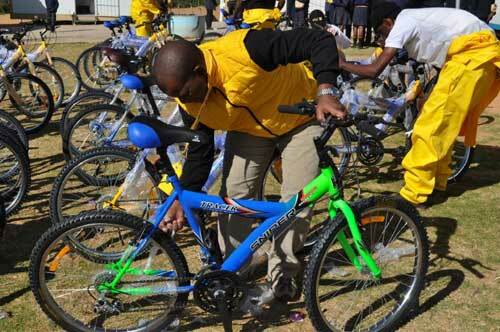 MTN staff will also visit Zandspruit Primary School in Honeydew, also in Johannesburg, to hand over bicycles and build a jungle gym for learners. In West Africa, MTN Guinea Bissau will rename a scholarship programme for 100 high school learners, launched during 21 Days of Y’ello Care, to the “Nelson Mandela Scholarship”, in honour of Madiba. To pay homage to Madiba, MTN will be presenting him with a book featuring pledges to serve humanity from our customers and MTN staff sent via www.mtn.com. The book will also showcase some of the highlights, in word and pictures, of the activities MTN employees undertook during the 21 Days of Y’ello Care programme in 2012. Were u paid to cover MTN? #JustAsking…if not then next year I would also expect February 21st Movement coverage…. Not paid at all. We felt it was news worthy given MTN’s position as the largest Telecoms company in Africa and the International stature of Mandela Day. Well, that’s a shame, I’m sure MTN would have paid good money for an advertorial of this calibre. I’ll give your details to someone in MTN Marketing, I’m sure this can be rectified: MTN is bribing everybody nowadays. we’d really appreciate that hey. we know u aint guaranteeing anything here, but how soon do you reckon we’ll get a call or email? I’m sorry guys, but I was previsously mistaken. I hereby rescind my previous statement that insinuated that MTN had bribed this esteemed blog or that a post was made to buy favours. Such allegations are unfounded and unsubstantiated. MTN. It’s Ayoba. MTN – Everywhere you go. Don’t forget, MTN is a socially responsible company. MTN. This message is sponsored by MTN – Everywhere you go. you dude, made my day! @aurther, MTN is not a Zim company to start with. And such free coverage to a big foreign company over a non-tech issue leaves a lot of questions. Even the SA blogs did not even give it any coverage. And the timing…i assume u know the scandals rocking it in the middle east and SA! Now the 21st Mvt isnt really different from Mandela Day, is it? Or how about coverage of the JM Nkomo-Econet thingy…that will be much better! @tongoona I appreciate your stand point but again in my view (i hold no brief for techzim) coverage of MTN is not coming out of the blue here. there have been post(s) published here before on the same company. Second, MTN has been widely reported before to be making overtures to players on the Zim market so again there is reasonable basis to have continued interest in the company’s activities in general. The matter itself being reported does not have to be a tech issue. What matters I suppose is the fact that it is being implemented by a tech company – just as Google has corporate social responsibilities in a variety of countries and tech blogs talk about it all the time. .Techcrunch,Wired and many others do this all the time and any reasonable person would consider them pacesetters in this sphere. Finally, the fact that there is a scandal is no reason to stop reportage on the company. In my view those complaining about the scandal are merely expressing their personal preferences which should not affect how the company is tracked by the media. So…when Netone celebrates our beloved RGM’s birthday, on the 21st, coverage will come naturally….yes? @tongoona it’s all up to Techzim editors. It’s really their call in my view. In our current reality the President’s birthday can have things easily become extremely political which will miss the point of a tech blog. Just to add; I appreciate your views, I was just giving a different take of things on MTN’s coverage. am sure its been a constructive debate! This being a tech site, the point of this article is what exactly? Brian Gondo is killing techzim for real. @kwabeza, where the hell are you?? ?